2. In a sauce pan over medium heat, add coconut milk, pureed pumpkin, and raw organic honey until your coconut milk is bubbling and steaming. 3. Remove from heat, stir in vanilla, cinnamon, and nutmeg/allspice. 4. Pour into the bottom half of a coffee cup, then pour in your strong coffee or espresso on top of it. Please note: if you have or have made coconut whip cream, you can add it on top and then sprinkle with some cocoa powder. (I did not do this. Nor did I use honey.) 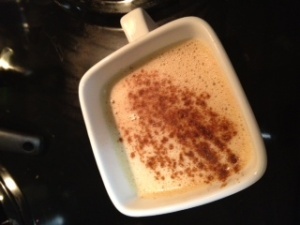 For even more latte-ness, use 2/3-1 cup coconut milk.